The stakes are high for both Apple and Samsung Electronics in their much-anticipated patent-infringement trial in front of a California jury. At the end of the proceedings, the 10-member jury, under the guidance of U.S. District Court judge Lucy Koh, will render a verdict that could cost one of the parties billions of dollars and change the competitive landscape in the consumer electronics industry. Perhaps it's no wonder that The Wall Street Journal has called it the "patent trial of the century." Apple filed its initial lawsuit on April 15, 2011. Samsung fired back with a countersuit a few days later and the two cases were subsequently combined into one. 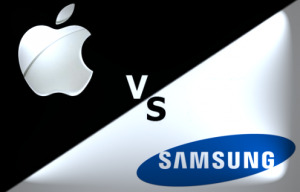 Apple claims that Samsung "deliberately" copied the design of the iPhone and iPad, and their packaging, when coming up with its Galaxy smartphones and Galaxy Tab tablet PCs. Apple has a list of patents that it says Samsung infringed upon and a nifty graphic that shows a transformation in Samsung phone design before and after the iPhone. This transformation is, according to Apple, "the basic story of our case." Samsung maintains that Apple's claims are all false and that the consumer electronics industry routinely looks to past products for inspiration. It has its own graphic designed to contradict Apple's assertion and show that Samsung had at least mock-ups of full-screen touch phones before the iPhone went on sale. Samsung will also be on the offensive, arguing that Apple infringed a number of its own patents covering technology in a cellphone. Money and a ban on sales of any products found to be infringing their patents. Apple is asking the jury to award it US$2.525 billion in damages. It then hopes the court will triple that figure using a U.S. legal statute that allows judges to multiply damages to punish willful misconduct. Samsung wants a royalty payment of 2.4 percent of the sale price of each product found to be misusing its patents, so it could potentially collect that on iPhone and iPad sales. Is There Anything More at Stake? Perhaps more broadly, the case could help determine where the U.S. legal system draws the line between what counts as copying and what is innovation. It could also influence the debate on the U.S. patent system, which critics say has been too liberal in issuing broad patents that in turn stifle innovation and lead to unnecessary lawsuits. Who's Going to Be in the Witness Box? It appears there won't be a star-studded cast like the one we saw in the recent Oracle-Google trial, where CEOs Larry Ellison and Larry Page both took the stand. Perhaps the biggest name on the witness lists submitted is Apple's Phil Schiller, the senior vice president of worldwide marketing who is often on stage at Apple product launches. Samsung will call Richard Howarth, one of the senior designers who worked on the original iPhone project. What Are We Likely to Learn? Corporate insight, gossip and tidbits that provide a glimpse into how powerful companies are run. We've already discovered, for example, that Apple looked to Sony for inspiration in coming up with the original iPhone design and that Samsung, in the words of U.S. Magistrate Judge Paul Grewal, "kept the shredder on" when it should have been keeping emails in anticipation of the case. Some internal memos could prove embarrassing, such as Samsung emails that talk about the iPhone's "beautiful design" and Apple marketing emails that discuss how many iPhone features weren't firsts. Lawyers for both companies have been pretty liberal with the big, black redaction marker, hiding large pieces of text from public versions of documents. Reuters filed a complaint to the court and Judge Koh chastised both sides for asking to seal so many documents. She warned them to assume that most of their submissions will be open to the public. A final pre-trial conference on July 27th will decide just what matters will be discussed only in closed court. Both sides have also been told they can't submit certain evidence including, in the case of Samsung, disparaging statements by Steve Jobs about Google's Android operating system, on which Samsung's products run. Next: Where the trial is taking place, how to view and how long the trial will take.